It's crazy chilly here in Philly today - and dank. Reminds me of the weather we had for football Saturdays last season. So, anyway - the season tickets arrived in the mail today. So exciting! Listen, I'll admit it - I'm a Harry Potter fan - and so, in the waning hours before the release of Book 7 - I thought I'd offer a few Harry Potter inspired recipes. 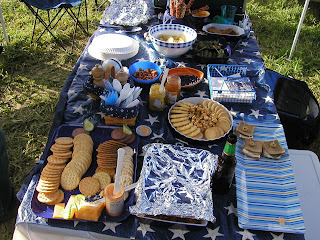 We haven't had a Harry Potter tailgate, by the way (yet! 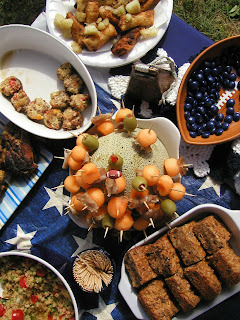 ), but these are all recipes that we have served at a tailgate. As with all dips/creamy foods - be sure to package and chill the items according to the weather. I like to divide my dips/spreads into smaller containers, keeping the unused portions in a cooler until ready to serve. Mix olives, garlic, parsley, lemon juice, salt and pepper in a food processor until very finely chopped. Mix all ingredients together and let chill for at least an hour (longer is better) - **note, if you find that your salsa is a bit watery, drain it before adding to the mixture. Mix all ingredients together and let chill overnight - the flavors will be more pronounced the longer it sits. Set for August 31st - check out the details at GoPSUsports.com. On the NFL network's 2007 Players Rookie Premiere? Of course, you didn't, because no one gets the NFL network. Anyway, it was a rookie press junket and playing card photoshoot - it was interesting to see the different players posing for their trading card pix - Upper Deck definitely has a more interesting approach - with action shots, versus the "yearbook" style many others employ. I didn't see Levi - he may have been on while I was "away" - but I did see a clip of Tony Hunt (looking good in dark green) talking about how he loves animals and has a lot of pets (okay, it was a little weird and Tony looks a little odd without a white helmet - but as I'm a crazy homer - I'll say it was sweet). When they spoke with Ted Ginn, Jr and Troy Smith I had to flip the channel - I just couldn't stomach those guys. mmmmm, main course meat. As a general rule - every tailgate needs a main dish - a meat dish. We try to offer a variety of meats during the season (although pork does always play a major role) - A crowd favorite is corned beef and cabbage. We've served this recipe for our "British Isles Pub" theme (it also does rather well on St. Patrick's Day). Place the corned beef in a large Dutch oven with a tight-fitting lid; add the water, bay leaves, peppercorns, and cloves. Bring to a boil, uncovered, and skim off any scum that rises to the surface. Cover and transfer pan to the oven, and braise until very tender, about 3 hours. At this point - if you're heading out to the parking lots, secure that tight fitting lid, wrap a few towels around the dutch oven and go get in line (if your commute to the parking lot is especially long, allow the contends to cool and transport in your cooler) - At the game, fire up the camp stove and set the pot to simmer for about another hour (until the beef is quite tender). With about 30 minutes to go add the cabbage and potatoes and bring to a boil. Lower the heat and simmer until the vegetables are tender. You can add the vegetables sooner or later, depending on your taste. Slice the corned beef into thin slices. Serve with the cabbage and potatoes. Ladle some of the hot cooking liquid over the corned beef and season with pepper. Serve with mustard or horseradish sauce. The Penn State Alumni Association contacted me (about a month ago) to ask if they could use some photos from our website, 2theLion.com, for their upcoming Alumni newsletter announcing the Homecoming 2007 Cookbook - I of course (with the permission of our photographer) said yes. So, just for fun I was on the Alumni Association website today - and there, plain as day, on the front page, is an image from our tailgate, complete with Uncle Al's Burnt Keilbasa.